When Loughborough resident Steve Lowth was ready to upgrade his old fencing he really did his research, visiting several local suppliers and searching online. When he learned about composite fencing from Eurocell he looked no further. 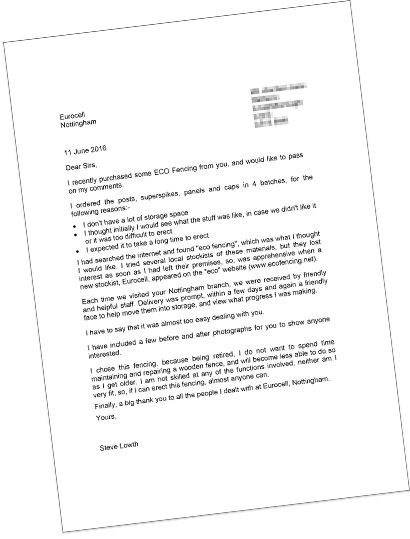 He was so impressed with how easy his composite fencing was to install, the quality of the posts and panneling and the great service he received from our Nottingham branch that he wrote us the lovely letter below. I recently purchased some ECO Fencing from you, and would like to pass on my comments. I had searched the internet and found "eco fencing", which was what I thought I would like. I tried several local stockists of these materials, but they lost interest as soon as I had left their premises, so, was apprehensive when a new stockist, Eurocell, appeared on the "eco" website (www.ecofencing.net). Each time we visited your Nottingham branch, we were received by friendly and helpful staff. Delivery was prompt, within a few days and again a friendly face to help move them into storage, and view what progress I was making. I have to say that it was almost too easy dealing with you. I have included a few before and after photographs for you to show anyone interested. I chose this fencing, because being retired, I do not want to spend time maintaining and repairing a wooden fence, and will become less able to do so as I get older. I am not skilled at any of the functions involved, neither am I very fit, so, if I can erect this fencing, almost anyone can. Finally, a big thank you to all the people I dealt with at Eurocell, Nottingham. Mr Lowth, it's our pleasure. We're very happy to have been able to help. This is the latest feather in the cap of the Eurocell Nottingham branch which has been serving the area for over 15 years. With innovative new products like composite decking increasing both our in branch and online offering all the time the future looks impressive for our branch network. Almost as impressive as Steve's new fencing! To get in touch with our Nottingham branch call 0115 985 2522 or find them here. Alternatively take a look at our online UPVC product catalogue here.